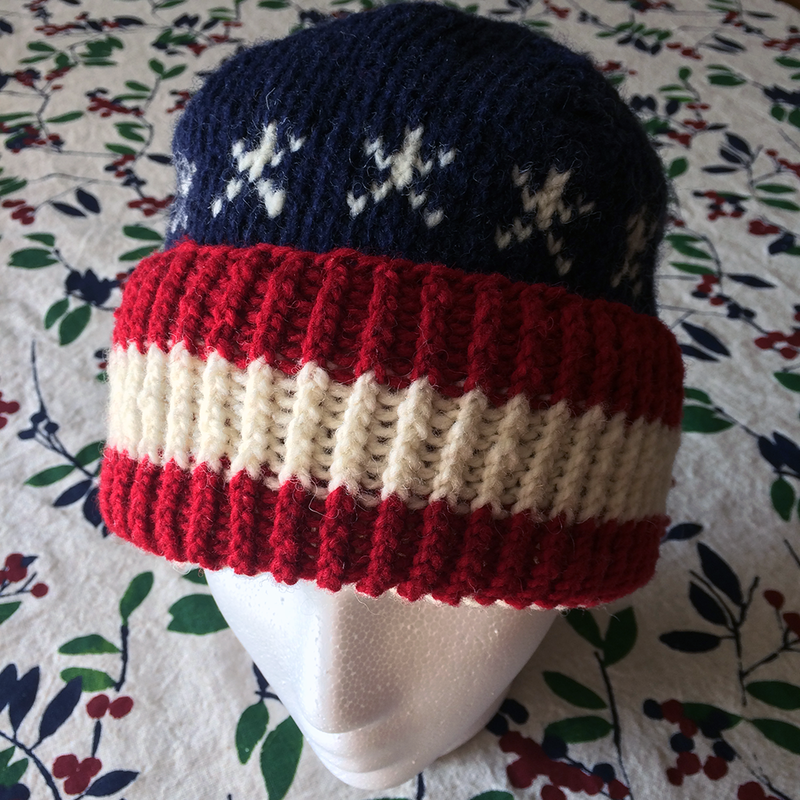 This week's blog post is slightly different; I have a free hat pattern I'd like to share with my readers and listeners. 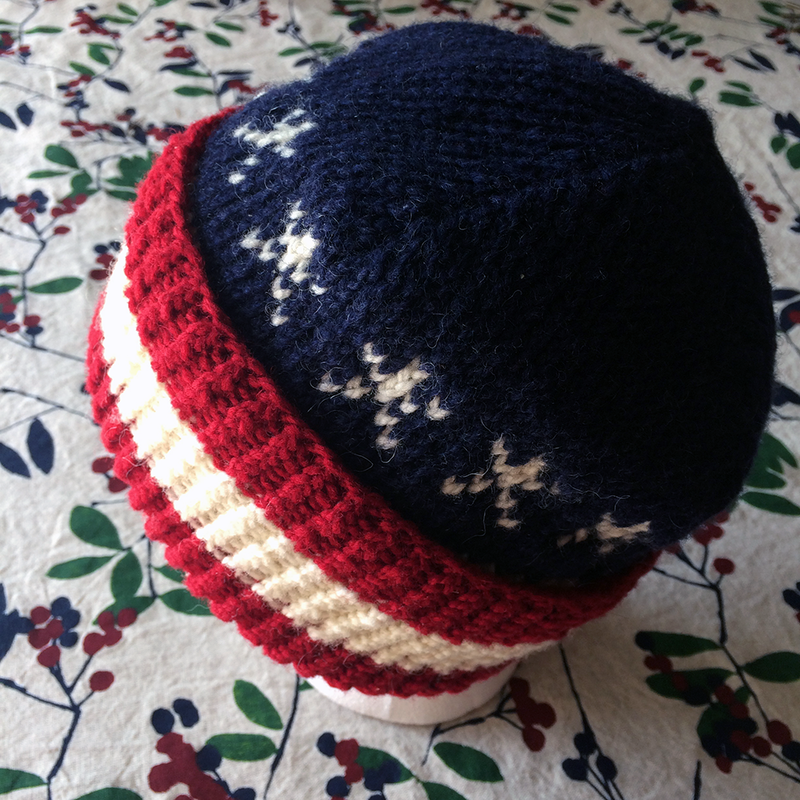 It's called the One Nation, Under God hat pattern. I mentioned this in the last podcast episode and explained that the title comes from the Pledge of Allegiance. As many of you know, I'm a teacher, and teachers recite this with their students 180 days a year. In my school, our principal recites the pledge over the PA most days. He also happened to mention how much he'd like one of my knitted hats earlier this year. (I made one for a teacher I was mentoring who wears it every day; I think my principal was slightly jealous since I've known him much longer than the new teacher!) When I asked about colors, he said he'd really (really) like a red, white, and blue one. I already had this yarn (it's the same yarn in different colors that I used for "that hat"). Two summers ago, I learned the fair isle technique and thought this was a good way to test my expertise. With good old graph paper at hand, I came up with my star pattern... and wouldn't you know, the number of stitches I decided to cast on was divisible by 13! Perfect since the colors I used reminded me of older flags I've seen in museums and in documentaries. Since the United States is known as the Land of the Free, I'm offering this pattern for free. All I ask is that you fill out the form below, and the pattern will be sent automatically. I'd like your email address because I plan to start sending a monthly newsletter to blog readers and podcast listeners in the near future. The newsletter will contain blog and podcast updates as well as giveaways, calls for test knitters, and future pattern publications. The pattern is also on Ravelry where you can find more detail about yarn, supplies, etc. I look forward to seeing many versions of the pattern in the months to come! Today, I'm joining Teresa at the Really Crafty Link Party. Every Tuesday, I join Nicole at the Keep Calm Craft On link party. On Wednesdays, I participate in the Yarn Along on Ginny Sheller's blog. Sometimes I post reviews at Cannonball Read. Please join us either by contributing a link to your fibery work in progress and current read and / or by checking out the posts to the link parties. You may find your next book or project waiting for you! I love the hat and, most of all, the story behind it. Thank you for sharing it at The Really Crafty Link Party this week. I'm not in the US so I'm not sure I'll ever use the pattern in those precise colors, but I did fill in the for because I would love to receive your newsletters anyway. That's very kind, thank you! I know it's a US centric hat, but we really need something to bring us together these days. We are still One Nation, Under God after all! Great hat! With all the political squabbling going on in our country right now, it's so nice to see someone doing something patriotic. I truly believe that, non matter where we are on the political spectrum, we all love our country. I LOVE your hat! and I love the story!! Blessings to you as a teacher, such an important job!